The Luray Sprint Triathlon attracts people to beautiful Page County, Virginia, every August. The multi-sport event’s beautiful backdrop is the scenic Shenandoah Valley with a challenging course that participants have referred to as the “benchmark of fitness”. But for 67-year-old Ray Grimes of Tappahannock, Virginia, participating in the triathlon has far greater meaning than the bucolic scenery or the athletic competition. Ray doesn’t consider himself an athlete, but his youngest daughter, Kimberly, tried to talk him into doing the Luray Triathlon with her one of the first years it took place. “I said, ‘Kimi, I’m an old man, I can’t do these things.’ But she would never let it go.” In 2008, Ray gave in. “I knew if I was ever going to do one with her, that would be it.” Despite never having participated in a multi-sport event before, Ray finished alongside Kimi. She waited for him after the swim and bike portions so they could do the run together, which included stopping to pick a flower in a field alongside the course, to give to her mother, Brenda, at the finish line. “For her it was never about winning,” Ray says, “it was just the experience of competing and doing it.” Kimi passed away two months later, just after her 28th birthday. Back then, Ray says most patients like Kimi were only surviving about five years, so when she hit her five year anniversary, the doctors were optimistic her chances of it ever returning were the same as the general population. Unfortunately, Kimi developed cancer again in her twenties. The cancer came back as a solid tumor but also manifested into leukemia and it was attached to her brain stem and throughout her brain. Kimi did chemotherapy but ultimately chose quality of life over the arduous treatments. 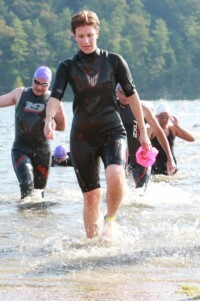 After Kimi passed, Ray was compelled to do the triathlon in her honor. “I just decided it was a nice thing,” he says. “She got me exercising again and I hadn’t been on a bike in decades. I think it was one of those things she wanted me to do to stay in shape, and so I did.” Ray has completed a triathlon every year since Kimi’s passing, except for the past two years when he’s been sidelined with knee injuries. Other family members have joined him, most notably his other daughter, Jen Vick, of Chapel Hill, North Carolina. “Triathlon is not something I would have ever in a million years considered myself doing,” Jen says. She considers herself a fairly athletic person but didn’t stay as active after college when her career and family started growing. Watching her younger sister battle through the Luray Triathlon changed Jen’s outlook. “You can’t find a more inspirational reason to get up and go.” But that’s not the only person who motivates Jen. “I am equally in awe and inspired by my father’s dedication to this,” she says. What a wonderful tribute! Thank your for sharing this story! Kimi was an angel on Earth, a spark of sunshine. She eluded His image and can’t imagine what you all went through in losing her. Her strength, and your strength, are inspirational. Love to you all!! I was so blessed to know Kimi even if it was for a short time! WOW what a special human being she was! Went with Kimi and her husband Lite and some of the kids she taught to Niagara Falls New York! Those kids loved her so much! I think of Kimi every year when we send our donations to St Jude! Kimi died shortly after that trip! The world lost a VERY special gem! RIP Miss Kimi! I loved Kimi so much and loved listening to her testimony about Jesus. She and our Cody are together as he accepted the Lord 4 days before he died. Miss them both so much.